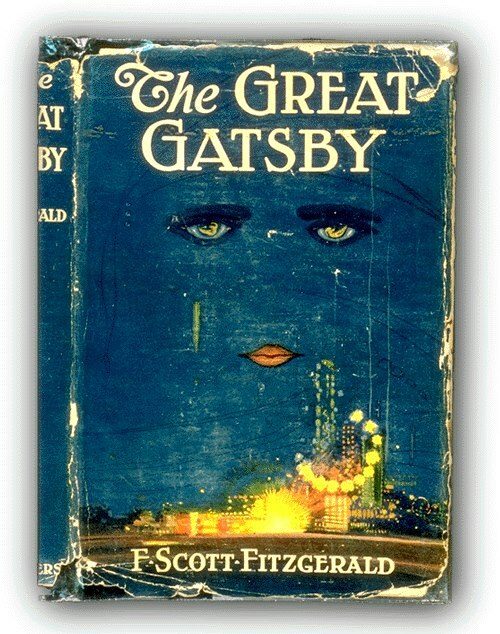 On April 10th, 1925 F. Scott Fitzgerald’s The Great Gatsby was published, and whenever I hear anyone say that they are going to “write The Great American Novel,” I am pretty sure that this is the book that is swimming in everyone’s head. I know it is the first one I think of, and I am not alone. When the movie was coming out with Leonardo DiCaprio, I celebrated this anniversary of the novel by becoming completely obsessed with the May premiere of the big Baz Luhrmann film version, and I began a big one-month countdown to the opening. I wasn’t sure if I could wait that long, but if Jay Gatsby could wait five years to see Daisy Fay Buchanan again, then I guessed I could wait one month for this film. Guess what? I survived. But whether you loved or hated the Leo movie, the Redford version, or the play version that was performed in Galveston last month at The Grand, here are ten great things about The Great Gatsby (the book, that is) that will remind you of why it is just so, well, great. This is great because you can also use this on your own kids, even if it isn’t really true. 2. Best First Person Narrator: Even if you think that Nick Carraway is sort of a snob, he reels you into the novel as if you were part of a conspiracy, and you are in the thick of that excitement from the first page until the last. He is “within and without,” a role that Fitzgerald himself played as an autobiographical writer, and a role the reader feels as if he or she is playing when observing and judging his intricate narrative. 3. Best Settings: It is hard to beat the decadence of Long Island, both the grit and the glamour of New York City, the glimmers of France and Montenegro, and did you know that San Francisco is smack dab in the Midwest? 4. Best Golden Girl: Daisy Fay Buchanan has great lines like “I’m p-paralyzed with happiness” and “Sophisticated–God, I’m sophisticated!” and “You want too much.” You have to figure out if she is being ironic, and Nick finds this irritating in women, so therefore, he does not trust her. Or any other woman. 5. Best BFF Sidekick: Jordan Baker. I know she is morally vapid, but if it were not for her, we would have no backstory whatsoever about Daisy’s prior love for Gatsby. And she says things like “Tom’s got some woman in New York.” If that doesn’t liven up a dinner party, I don’t know what will. 6. Best Bad Guy: Tom Buchanan, AKA “Mr. Civilization is going to pieces.” I still cannot believe that he knows the word “Nordic.” Even with all of that money, he is hard to like, and Fitzgerald had accomplished something right there given the American tendency to forgive anything and everything in those who have money. 9. Best Moral Dilemmas: Love or Rules? Forgetting the past, or changing it? Marriage or adultery? Learning the bond business or fasttracking to bootlegging? Goodness, the roaring twenties were not quiet for a reason, and this novel helps us figure out why. 10. Best Closing Lines of a Novel: “So we beat on, boats against the current, borne back ceaselessly into the past.” I sure wish I had written that line. But Fitzgerald did, and it is great every single time. This is The Great American Novel, and the best part is that for right now, it still is. Now, I want to read it again! And, I think I will!!! Me too! And then I want to see the movie! Excellent! That makes me want to read it again! My favorite is #8 — Most Excruciating Film Versions. Because GOODNESS, they’re terrible. I’m rereading the book right now (for probably the twentieth time). I cannot wait for May 10th! Love the list, Dr. Wilson! I don’t know. I saw a short preview and I didn’t like Leo as Gatsby. I don’t know who would be right (Paul Newman 40 years ago, maybe?) but I don’t think Leo is going to be able to pull off the vulnerability. I’m willing to be wrong after I see it. But now, I am not sure I want to. I’ll wait for your review. #10 is not only one of the best closing lines in a novel, but of literature from that period. It is one of my favorite lines ever written. Great post, Doni. It does make me want to read Gatsby again. I also hate to admit this, but I’m curious about the upcoming movie–it looks pretty good! love it! hope more students tune in to this post to appreciate the book before the movie comes out! For the anniversary of the publication of The Great Gatsby….. Favorite line of your blog: If that doesn’t liven up a dinner party, I don’t know what will. This is proof positive that everyone should read the classics. I only read this a couple years ago, and so I enjoyed the movie more and now I can enjoy this blog thoroughly. The classics! And what an awesome book it was. In fact, I really did see it like a movie in front of my eyes, the description was so clear. “Nordic” was a very common way of referring to whites or members of the “Aryan” race at the time, especially popular with eugenicists like Tom.